The Orbit of Jupiter. How Long is a Year on Jupiter? When it comes to the other planets that make up our Solar System, some pretty stark differences become apparent. In addition to being different in terms of their sizes, composition and atmospheres from Earth, they also differ considerably in terms of their orbits. Whereas those closest to the Sun have rapid transits, and therefore comparatively short years, those farther away can take many Earth to complete a single orbit. This is certainly the case when it comes to Jupiter, the Solar System largest and most massive planet. Given its considerable distance from the Sun, Jupiter spends the equivalent of almost twelve Earth years completing a single circuit of our Sun. Orbiting at this distance is part of what allows Jupiter to maintain its gaseous nature, and led to its formation and peculiar composition. With an axial tilt of just 3.13 degrees, Jupiter also has one of the least inclined orbits of any planet in the Solar System. Only Mercury and Venus have more vertical axes, with a tilt of 0.03° and 2.64° respectively. As a result, Jupiter does not experience seasonal changes the way the other planets do – particularly Earth (23.44°), Mars (25.19°) and Saturn (26.73°). As a result, temperatures do not vary considerably between the northern or southern hemispheres during the course of its orbit. Measurements taken from the top of Jupiter’s clouds (which is considered to be the surface) indicate that surface temperatures vary between 165 K and 112 K (-108 °C and -161 °C). However, temperatures vary considerably due to depth, increasing drastically as one ventures closer to the core. Jupiter’s composition and position in the Solar System are interrelated. According to Nebular Theory, the Sun and all the planets of our Solar System began as a giant cloud of molecular gas and dust (called a solar nebula). Then, about 4.57 billion years ago, something happened that caused the cloud to collapse, which could have been the result of anything from a passing star to shock waves from a supernova. From this collapse, pockets of dust and gas began to collect into denser regions. As the denser regions pulled in more and more matter, conservation of momentum caused them to begin rotating, while increasing pressure caused them to heat up. Since temperatures across this protoplanetary disk were not uniform, this caused different materials to condense at different temperatures, leading to different types of planets forming. The dividing line for the different planets in our solar system is known as the “Frost Line”, a point in the Solar System beyond which volatiles (such as water, ammonia, methane, carbon dioxide and carbon monoxide) are able to exist in a frozen state. As a result, planets like Jupiter, which are located beyond the Frost Line, condensed out of denser materials first (like silicate rock and minerals), then were able to accumulate gases in a liquid state. In addition to ensuring that Jupiter was able to become the massive gas giant it is today, its distance from the Sun is also what makes its orbital period much longer than that of Earth’s. We have written many articles about Jupiter here at Universe Today. Here’s The Gas Giant Jupiter, Ten Interesting Facts About Jupiter, Jupiter Compared to Earth, How Long Does it Take to get to Jupiter?, Could We Terraform Jupiter? 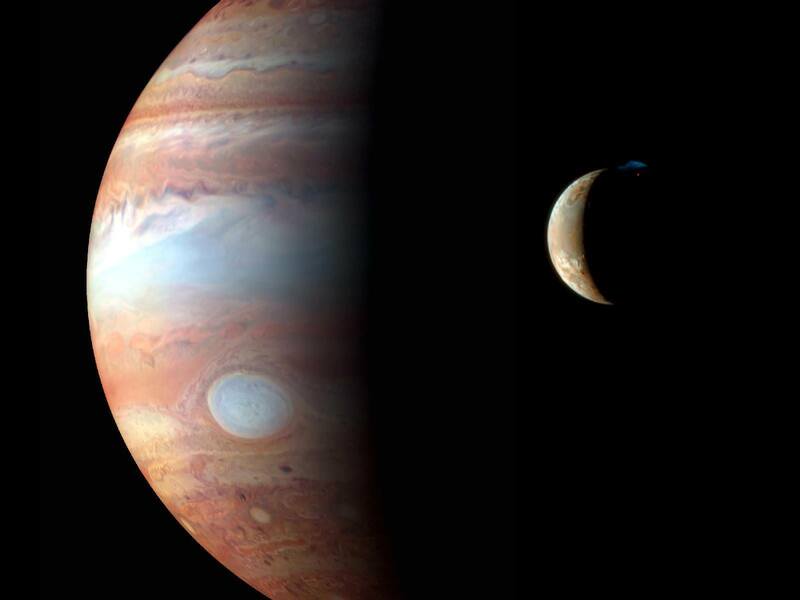 If you’d like more information on Jupiter, check out Hubblesite’s News Releases about Jupiter. And here’s an article about Jupiter on the NASA Solar System Exploration Guide. We have also recorded an episode of Astronomy Cast about Jupiter. You can listen here, Episode 56: Jupiter. Jupiter: King of closely observed planets; superlatives don’t do it justice. All of the Jovian planets offer examples of pretty extreme physics that exist below the level of stellar physics. Orbital inclination and axial tilt are two completely different things. See Uranus and its 97.8° axial tilt, while having only a 0.77° inclination. Also, Venus has an axial tilt of 177.3° (its north pole is nearly opposite that of Earths), and so should be considered the one with the most extreme title. That’s its axial tilt relative to its orbit, which is due to Venus having retrograde rotation. When this is factored in, its axial tilt is only 2.64 degrees, one of the lowest in the Solar System.